Location: Vila Cha, Alijo, Portugal. 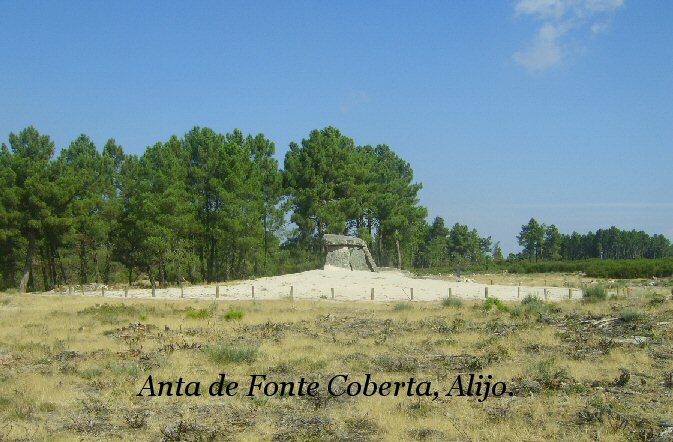 Grid Reference: 41° 20’ N, 7° 28’ W.
Anta de Fonte Coberta: (Passage Mound). 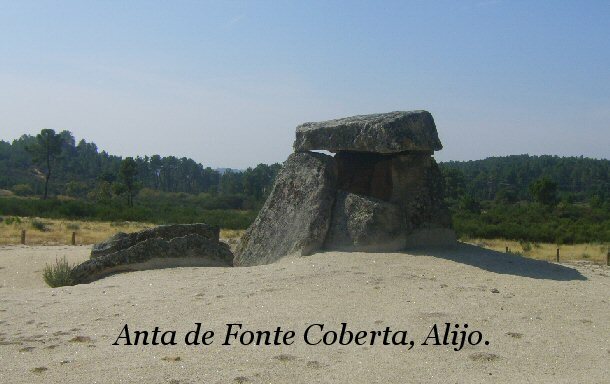 Commonly considered as one of the most important 'Anta's' in Northern Portugal. This anta stands isolated on a plateau at around 3m high, has the 'standard' seven uprights and flattened capstone on the underside, but also contains traces of Red Ochre and Cup-marks. Traces of a mound suggest that this monument was once, at least, partially covered. "It is interesting to notice that the pre-Christian custom called dessil, or circuit around a venerated spot; which is practised in Ireland in the case of one dolmen at least, as well as at wells and Churches innumerable, is found also in Portugal... 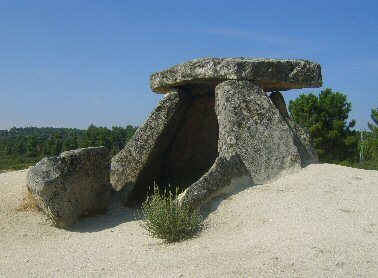 It is not in Ireland alone that dolmens are associated with the notion of wells and water springs. The Portuguese names, Anta do Fontao, Fonte Coberta, Anta do Fonte-de Mouratao, and the French names, Fonte de Bourre, and Fonte nay le Marmion, show this to be the case". 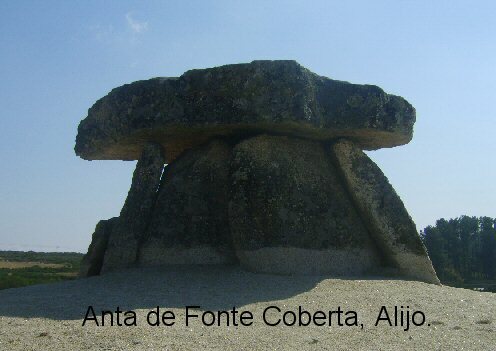 The Eastern upright has been broken in half, a feature common to many Portuguese Anta's. The tide-line around the bottom shows the erosion of the mound over the last few years only ... before which (i.e. 2006), the ground surrounding the Anta was covered in grass. 1). Norman Lockyer, Stonehenge and Other British Stone Monuments Astronomically Considered, 1906.